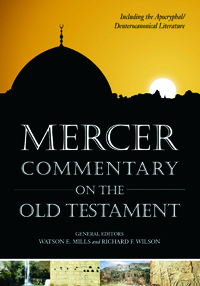 Volume 1 of the Mercer Commentary on the Bible (MCB) comprises commentary on the Pentateuch/Torah with several appropriate articles from the Mercer Dictionary of the Bible (MDB). This convenient text is for the classroom and for anyone who wishes to focus on the study of the Pentateuch. Other volumes in the series focus on other appropriate groups of canonical writings (Pentateuch, Gospels, and so forth; see page vii for list). Each volume includes MCB commentaries and appropriate articles from MDB.